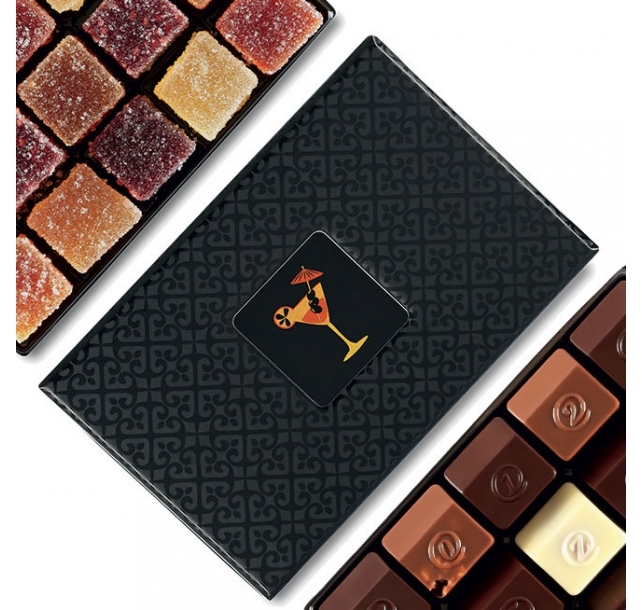 Description: Handcrafted gourmet chocolates are partnered with the fresh flavors of orchard-ripened fruit in this special Summer zBox. Packaged in a colorful edition of our always-sophisticated ballotin, each order includes 15 pieces of our most-requested chocolate recipes bundled with a complimentary assortment of pates de fruits candies. A uniquely French way to send warm-weather wishes throughout the summer. Description: Stress is no match for France’s finest chocolate. 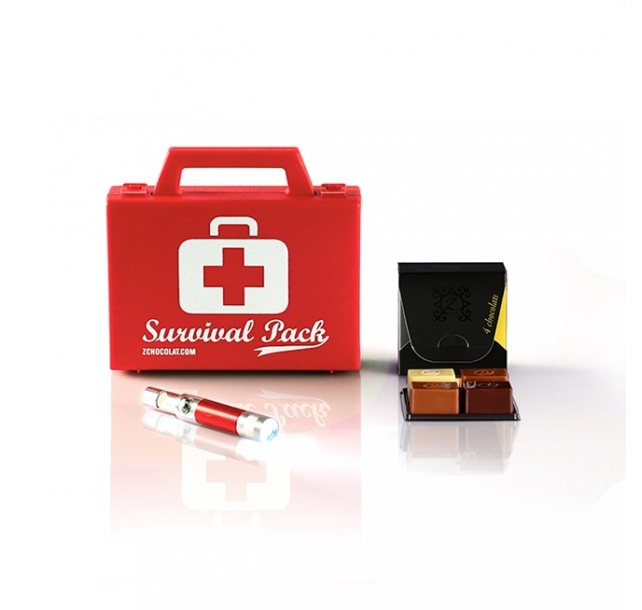 Help someone weather life’s challenges with the Survival Pack 4-piece. Featuring our four most requested recipes (a slow-roasted hazelnut praline, a decadent vanilla ganache-filled chocolate, a splendidly rich Italian gianduja praline, and our world-famous salty-sweet Z chocolate) alongside a high-quality LED flashlight keyring, it’s the epitome of practical pampering. Shipped in playfully bold packaging, it’s a surefire way to brighten even the toughest days. 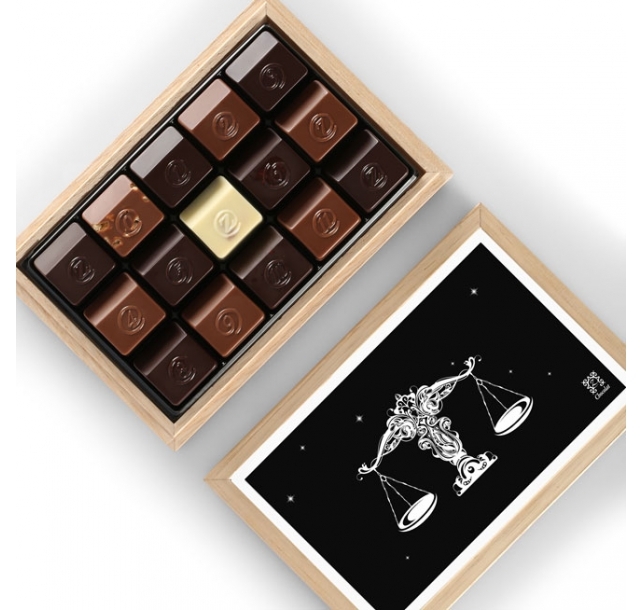 Description: Indulge the naturally romantic nature of Libra (September 23 – October 22) with a sumptuous chocolate gift from the heart of France. Each Zodiac Box is handcrafted from regional chestnut wood and adorned with an artistic rendition of the current astrological sign. Filled with fifteen pieces of decadent French chocolate, it’s a sensational way to send a personalized birthday greeting, wish someone happiness and good fortune, or simply let them know you’re thinking of them throughout the seasons. 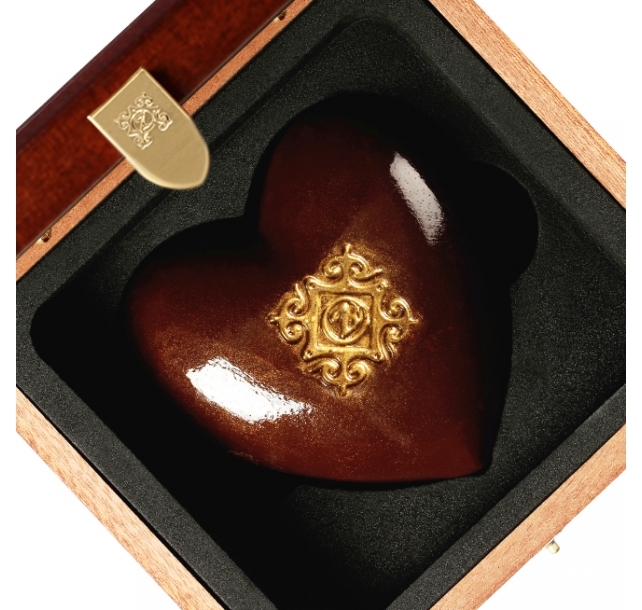 Description: Proclaim your passion and unconditional love with this bounteous, half pound chocolate masterpiece handmade by World Champion Chocolatier Pascal Caffet. 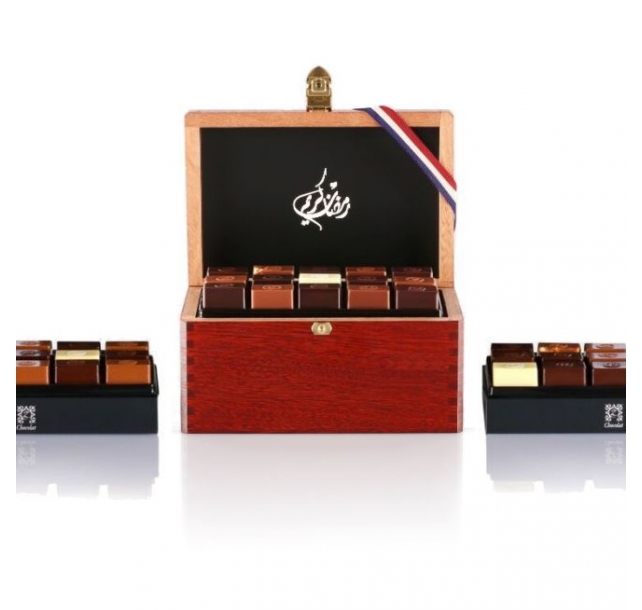 Its smooth, sensual exterior is comprised of resonant 70% Venezuelan dark chocolate. 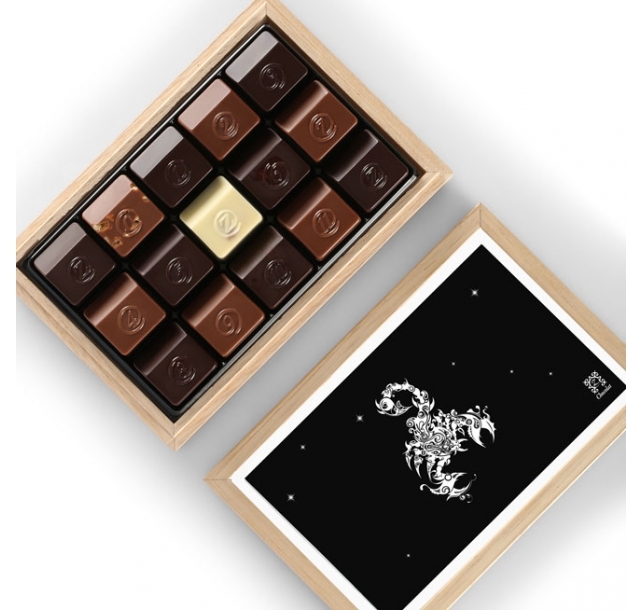 Within, resides a supreme praliné, studded with slow-roasted, caramelized Piedmont hazelnuts – saturated in unctuous, aromatic 40% Ivory Coast milk chocolate. Description: A perfect present for a valued client or partner, this 3 quarter of a pound work of art guarantees an indescribable savoring experience. 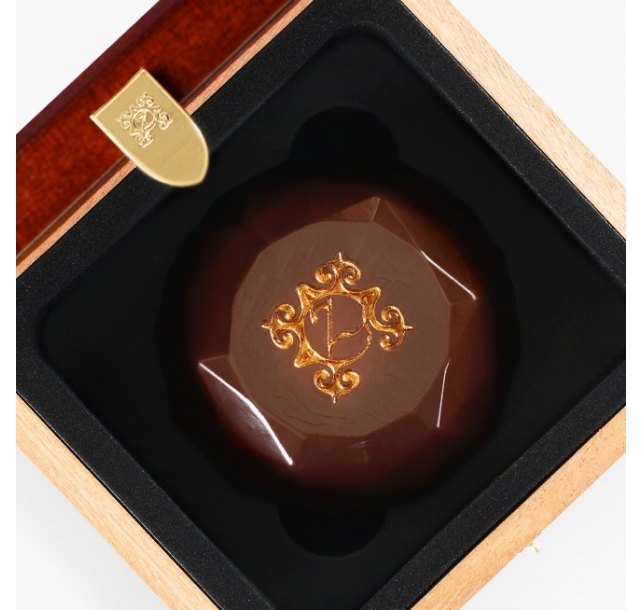 Framed with a scarce (2008 vintage) 73% intensely dark couverture from Bolivia, it reveals a whole slow-roasted caramelized Piedmont hazelnut center with a foundation of finely textured French praliné and a 40% Ivory Coast milk chocolate cover. Layered above is a virtuoso swirl of salty Madagascar vanilla caramel. Description: If diamonds are forever, Precious is the exception that proves the rule. Precious is unique, impressive, heavy, beautiful and terribly delicious. The inside combines our supreme praliné studded with slow-roasted, caramelized Piedmont hazelnuts with unctuous, aromatic layers of 40% Ivory Coast milk chocolate. The couverture is comprised of fine and resonant 70% Venezuelan dark chocolate. If you have already "proposed", Precious could be a powerful and sweet reminder that you would "do it all over again". If you haven't then why not start with the exception? Description: Totaling 2.3 pounds, this tantalizing trio includes our flagship Large Z chocolate, with layers of salty Madagascar vanilla caramel and caramelized Piedmont hazelnuts crunchy praliné; a Large Z Pépites, with rich toasted Valencia almonds in 40% Ivory Coast milk chocolate; and a Large Z Millefeuille, with alternating layers of Piedmont hazelnuts praliné, phyllo dough, and 70% Venezuelan dark chocolate, all dusted with golden powder. Each piece of gourmet art measures 3.4 inches tall. For lasting enjoyment, we recommend cutting each delicacy into thin slices with a sharp knife so it can be savored slowly. 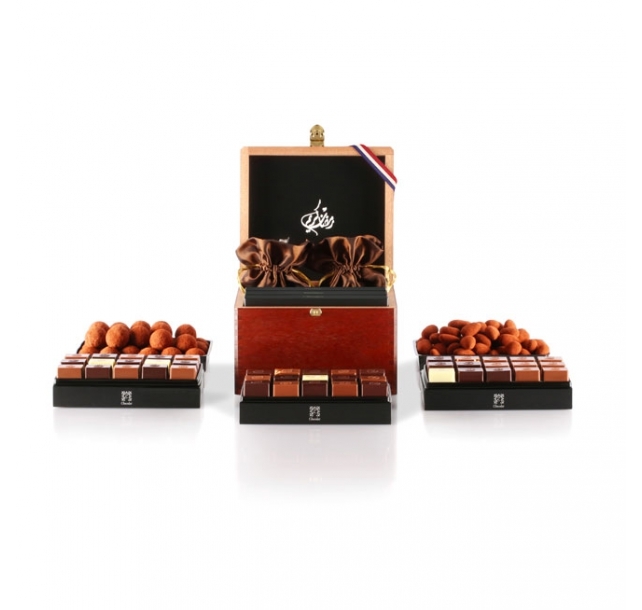 Description: Celebrate with family and friends during the traditional Eid al Fitr with this striking 15-piece assortment of our most popular recipes surrounding a single gold-covered Z chocolate without alcohol and without animal-fat, and displaying on the inside of the lid an elegant mosque design. 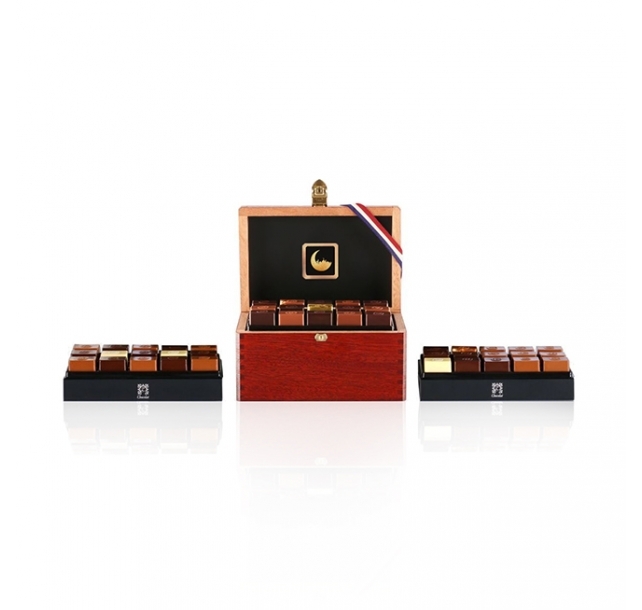 Description: Add sophistication and elegance to your celebrations with the Diamond Box. 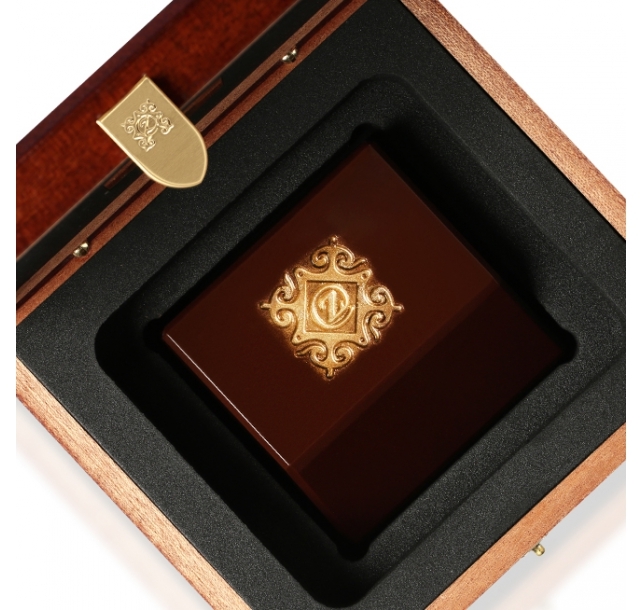 Inside this elegantly finished, naturally tight-grained and warm-toned mahogany packaging, discover a single Z chocolate gilded in pure 24 karat edible gold nestled alongside 44 of our other world-renowned gourmet chocolates. An incredibly luxurious way to share the best of the season with those you love. 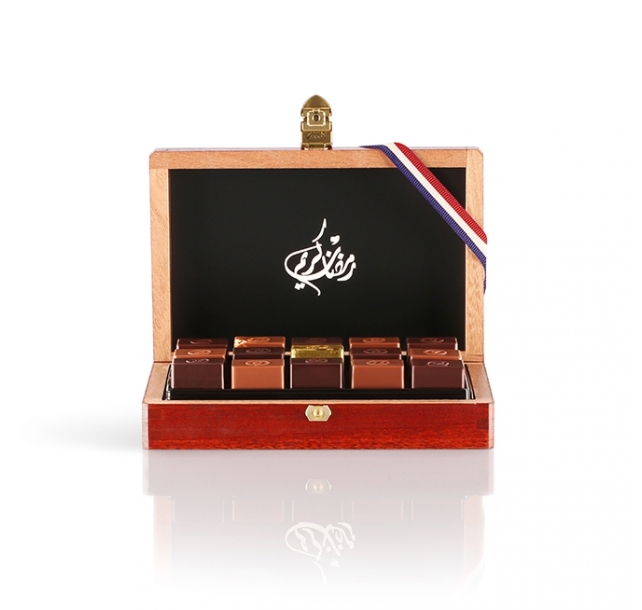 Description: Greet friends and family this season with a spectacular selection of France’s finest confections delivered in a sleek mahogany box embellished specifically for the occasion. 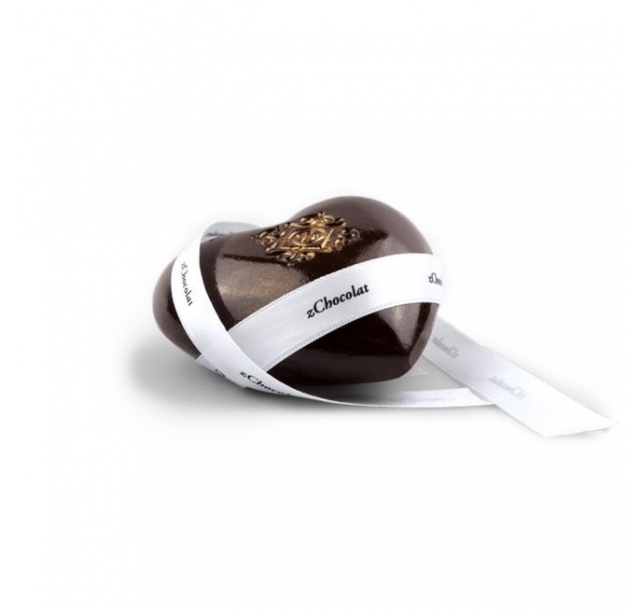 Filled with three assortments of our famous animal fat-free and alcohol-free chocolates, plus two cartons of our irresistible chocomandines dusted in rich Criollo cocoa powder, it’s a grandly gourmet way to express appreciation to those that matter most. 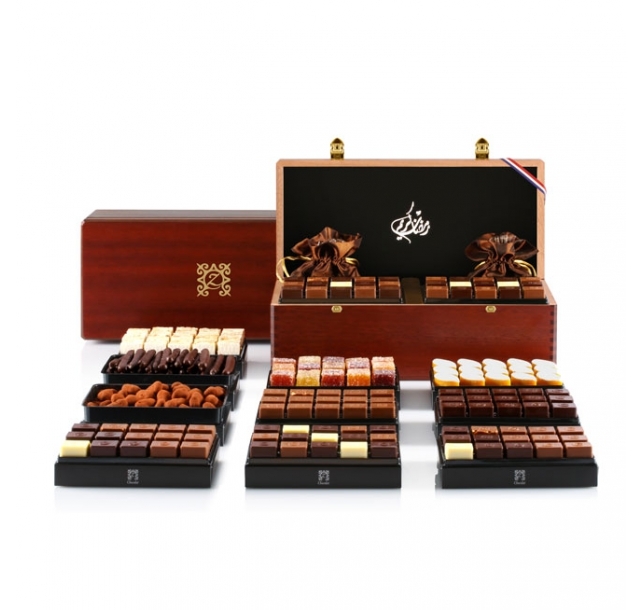 Description: Ideal for large gatherings and festive occasions, the Jade 11 brings together 9 indulgent assortments of our world-renowned, all-natural, chocolates along with two cartons of our inimitable chocomandines, featuring plump Valencia almonds and exclusively sourced Criollo cocoa powder. 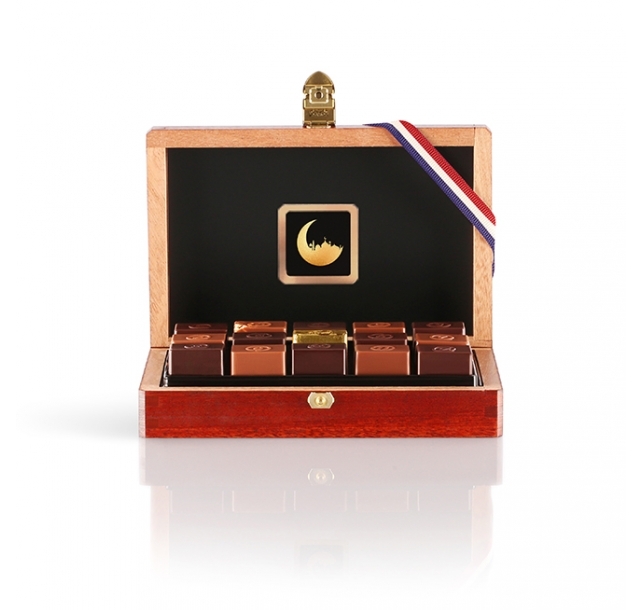 Packaged in a special-edition, over-sized mahogany box, it’s a tasteful way to elevate any seasonal event. 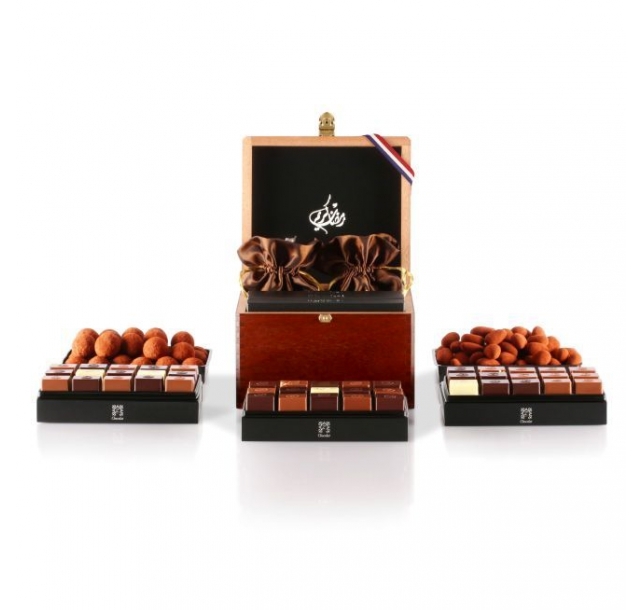 Description: Share the entire range of exceptional zChocolat flavors delivered with stunning seasonal flair. 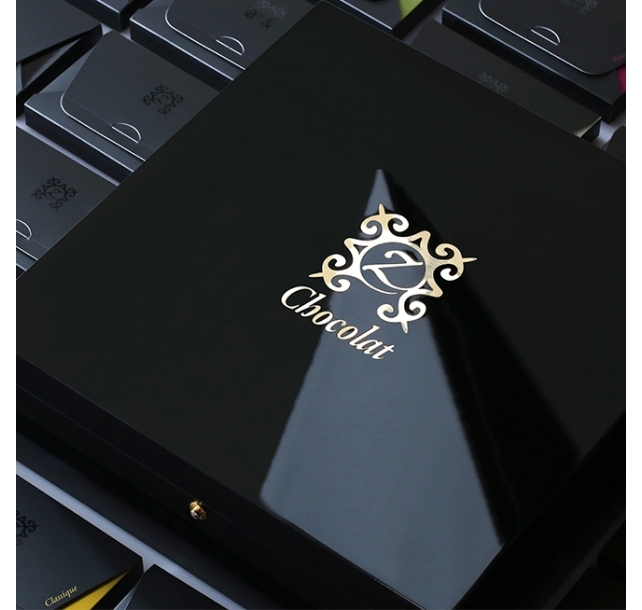 28 individual assortment cartons are each filled with our most richly indulgent chocolate creations, then packaged in a sophisticated lacquered wood box, for a gift that combines the best of traditional luxury and modern elegance. Every detail, from the sourcing of our all-natural ingredients to the painstaking twelve week production process for the boxes has been perfected to create a product of uncompromising quality, while a festive motif adds a gracious finishing touch to what can only be described as an unforgettable gift. Description: Surprise the meticulous side of Virgo (August 23 – September 22) with world-renowned gourmet chocolates in impossibly elegant packaging. Each Zodiac Box is handcrafted from regional chestnut wood and adorned with an artistic rendition of the current astrological sign. Filled with fifteen pieces of decadent French chocolate, it’s a sensational way to send a personalized birthday greeting, wish someone happiness and good fortune, or simply let them know you’re thinking of them throughout the seasons. 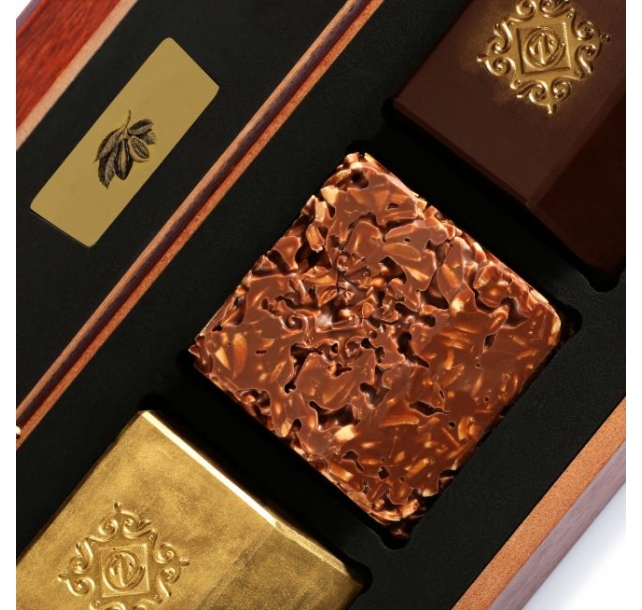 Description: A thin layer of food-grade 24 karat gold is wrapped around our signature Z chocolate, widely beloved for its layers of crunchy praline and sweet-salty caramel, to create the impossibly decadent star of this selection. Bundled together with our N0, N1, and N2 chocolates in a luxuriously rich-toned mahogany box adorned with an elegant seasonal greeting, it’s a petite-sized present that can’t help but impress. Description: Awe friends and family this season with a striking assortment of our most requested recipes surrounding a single gold-covered Z chocolate. Made with all natural ingredients and without alcohol or animal-fat, our chocolates are distinctively enticing and have come to define the best in French culinary indulgence. 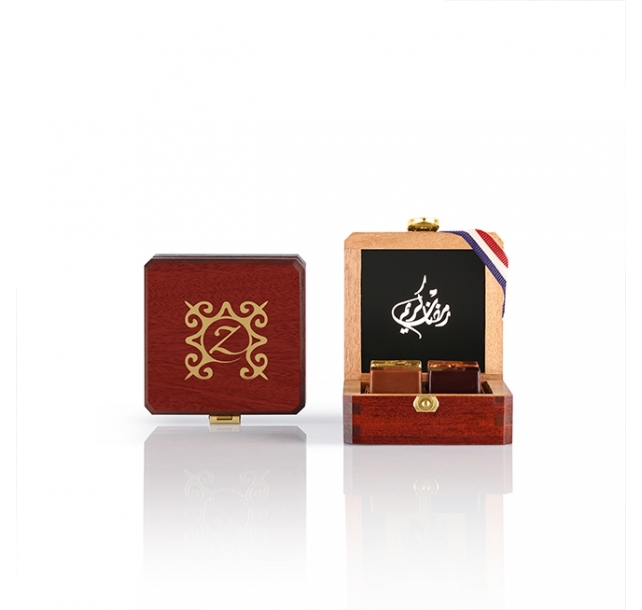 Packaged in a handcrafted mahogany box decorated with a traditional greeting, it’s a stunning way to commemorate meaningful moments spent together.